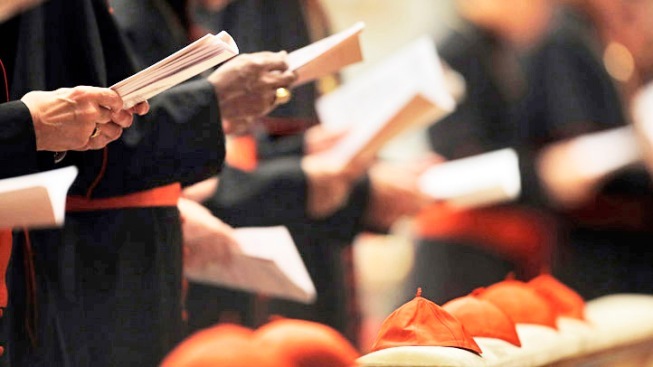 Cardinals voting for the new pope are bound by strict guidelines that were established and tweaked over time to weed out corrupt practices that once abounded. The oaths of secrecy, locked doors and smoke signals that give modern papal elections an air of intrigue trace their roots back to a political solution much more practical than mysterious. Their origins date back more than 700 years to a papal election that dragged on so long that two cardinals died before a successor was selected. For more world news coverage, visit NBCNews.com. The chaos of that election prompted a series of reforms, which, after a few bumps — a Papal Schism, monarchial meddling and a string of "secret" elections tainted by blatant leaks — ultimately formed the more orderly foundation of modern conclaves. When Pope Clement IV died in 1268, partisan cardinals were unable to muster the requisite two-thirds majority to elect a successor — leaving the seat of the Supreme Pontiff vacant for nearly three years. Frustrated by the enduring deadlock, citizens of Viterbo, Italy, where the cardinals were gathered, sealed the doors of their meeting place and drastically restricted the voters' food supply in an effort to hasten their decision-making. As weeks passed, a crowd went a step further to "unroof" the building, presumably hoping exposure to the elements might expedite consensus. According to the account in Virginia Tech history professor Frédéric J. Baumgartner's "Behind Locked Doors: A History of the Papal Elections," the locals "supposedly acted on the humorous comment of the English cardinal present that the roof should be removed to give free access to the Holy Spirit." Others say the "unroofing" is a bit of a stretch. Brother Charles Hilken, professor of medieval history at Saint Mary's College of California, describes it as "more of a case of the town fathers dragging their heels in repairing leaks and openings in the roof. The conclave continued for another year after the complaints of the cardinals." Eventually, voters were able to agree on Pope Gregory X— but not before two cardinals died and another left because of poor health. Inspired by the lockdown's success and eager to limit outside influence, which often made for rocky transitions of papal power, Gregory introduced new election procedures in a charter that set the foundation for modern-day conclaves. Under his decree, all cardinals would be barricaded in a voting room and forced to share sleeping quarters until they could achieve a two-thirds vote. Under threat of excommunication, no one was permitted to leak or receive messages from the outside world. If after three days a pope had not been elected, food rations would be reduced. Gregory's reforms at least initially expedited elections. But they were no match for some of the corruption that would later find its way into the papacy. In 1309, the papacy relocated to Avignon. But by 1377, Romans, eager to see a local pope return the papacy to their hometown, gathered outside the Lateran Palace, where cardinals were voting for a successor, and chanted their demands. In the end, the cardinals picked Urban VI — an Italian, though not a Roman. Fearful that the crowds might not like the selection, cardinals discussed ushering him out through a back door and presenting the crowd with a well-known elderly Roman cardinal in papal robes, in the elected pope's stead. Some accounts indicate that the cardinals actually carried out their plot. Shortly after Urban's reign began, cardinals who came to believe they had elected an insane pope ordered new elections. Pope Clement VII was selected, but Urban clung to power. He and Clement excommunicated each other, divided the church in what was later labeled the Papal Schism, and ushered in decades of utter confusion. The papal conclave of 1549 to 1550 had all the signs of corruption Gregory X's decree had aimed to stamp out. The conclave dragged on for weeks. Holy Roman Emperor Charles V and King Henry II of France had their favorites and did everything they could to sway the vote, with Henry threatening to pull funding if the pick weren't to his liking. After voting began and France’s ambassador saw it didn't favor his country, he convinced authorities to halt voting until several French cardinals still en route had arrived. Even after the missing cardinals had trickled in, the process was delayed once again — after a cardinal died in the conclave of possible poisoning. Meanwhile, bookmakers in Rome were solidifying their bets on the outcome — something that was legal and commonplace at the time. Baumgartner, author of "A History of the Papal Elections," notes that this conclave was one of the best-reported ever thanks to the incessant leaks both into and out of the "secret" proceedings. "For one thing, the ambassadors were allowed to enter the conclave," Baumgartner said. "They could bring in information and carry out information to their kings. On top of that, conclavists were in close touch with the bookies of Rome." Thanks to a compromise, an Italian named Giovanni Maria Ciocchi del Monte won out as pope. He took the name of Julius III.